Special Thank You! to Jim and his family and community for sharing images from their lives and their beautiful land with us. Also thanks to Ann for sharing some of her personal favourites! Fair Mining Practices: A New Mining Code for British Columbia was commissioned by the Fair Mining Collaborative, and written by Maya Stano and Emma Lehrer. The Fair Mining Collaborative wishes to thank law students, Timothy Quirk and Glenn Grande, for their tremendous assistance and for finalizing thousands of footnotes, and Tara Ammerlaan for reviewing and editing final drafts. Calvin Sandborn (Director, Environmental Law Centre, Victoria); Murray Browne (Lawyer, Woodward & Company, Victoria); Bonnie Docherty (Professor, Harvard Law School’s International Human Rights Clinic, Boston); Jay Nelson (Lawyer, Woodward & Company, Victoria); Albert Wu, John Cella, Matthew Parker, Jae Kim (Former Law Students at Harvard Law School’s International Human Rights Clinic, Boston) Mark Haddock (Lawyer, Environmental Law Centre, Victoria); Tony Pearse (Consultant, Resource Planning), Shelley Murphy (Project Assistant, British Columbia Environmental Assessment Office, Victoria); Judah Harrison, Sean Nixon (Lawyers, Ecojustice, Vancouver); Rachel Forbes, Andrew Gage, (Lawyers, West Coast Environmental Law, Vancouver); Merle Alexander (Lawyer, Bull, Houser & Tupper Ltd, Vancouver); Liz Mitchell (Lawyer, Environmental Law Alliance Worldwide); Anna Johnston (Lawyer, In Law and Equity); David Chambers (Geophysicist, Centre for Science in Public Participation, Montana); Anne Currie (Former Chief Gold Commissioner, Ministry of Energy & Mines, Victoria); Maria Laura Barreto (Director, Materials Efficiency Research Group, Ottawa); Lina Duarte, Luisa Fernandez Mejia, Hugo Palacios Mejia & Pedro Pacheco (Lawyers, Estudios Palacios Lleras SAS, Colombia); Roderick Salazar (Lawyer, Fortun Narvasa Salazar, Philippines); Satyajit Gupta, Shaili Parsheera & Vinati Kastia (Lawyers, AZB Partners, India); José Yataco Arias (Lawyer, Estudio Yataco Arias Abogados, Peru); Dr. S. Nadarajah & Yew Chen Kuok (Lawyers, Christopher Lee & Co., Malaysia); Carlos Enrique Alfaro & Giselle Geuna (Lawyers, Alfaro-Abogados, Argentina); Rui Botica Santos & Goncalo Lestro (Lawyers, CRA Timor Leste, East Timor); Courtenay Barklem (Lawyer, McCue and Partners (London), Review of California); Theodoor Bakker, (Lawyer, ABNR Law, Indonesia); Caroline Bérubé (Lawyer, HJM Asia Law & Co LLC, China); Oshni Arachchi (LLM International Human Rights Law and Labour Law); Stella Dunn & Team (Pro Bono Coordinator and Supervising Solicitor, The College of Law of England and Wales, Review of European Union); Allison Ross (Law Student, Seattle University School of Law, Washington State); Judith Bongartz (Law Student, Trier University, Germany). We also wish to thank Elisabeth Baraka and Nadia Hardman (Projects Officer, Deputy Head of Partnerships and Legal Services, Advocates for International Development, United Kingdom) for their assistance in assembling a team of international reviewers. 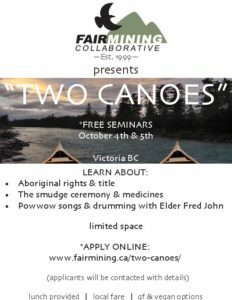 Fair Mining Collaborative wishes to thank the Justice Education Society for their hard work and guidance preparing Learn About Mining: Problems and Solutions. JES also provided assistance with preparing and filming our videos, and created a HTML home for Fair Mining Practices: A New Mining Code for BC. Many thanks to Winterstreet Design for their patience, attention to detail, and instruction. And to Jeff Capella from Resource Media for invaluable assistance designing and editing website material, and coaching our team. Finally, we thank the funders whose generous contributions make our work possible.